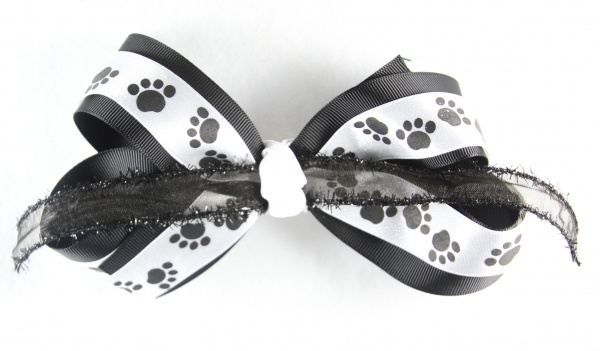 This Go Dogs Paw Prints Bow will remind you of the 101 Dalmations running away from the mean Cruella Deville! This is a double layered bow, the bottom is a black 1.5" wide grosgrain ribbon. The top layer is a white 7/8" satin ribbon that is covered with black dog foot prints. The center is wrapped into a french knot with a white grosgrain ribbon, which holds the black sheer ribbon in place as it runs through the center of the bow. GO Dogs GO!